I received a call from Hanks Yanks Charity Advisor Mike Walsh. He asked, if I could help out another worthwhile cause. It’s no secret that I attend many charity events. As poor as I am, I am lucky to give back in my own way. A lot of times your time is more valuable than your wallet. A person that is able to do both is the great actor Mark Wahlberg. It seems that I am always running into Mark at one event or another, always helping the less privileged. I’m not friends with Mark Wahlberg but I like and admire him very much. It is heartwarming how many kids he has helped over the years even with his incredibly busy film schedule. On December 7th, Mark and the Mark Wahlberg Foundation is hosting “Miracle Day” at the New York Trading Floor of the CIBC Bank. The event consists of traders donating their commissions from their entire days of trade. Ray Negron can be heard on Impact every Sunday from 11am-1pm on ESPN Deportes 1050am and on Newsmax. just finished watching the “Making of Mr. October” on the MLB Network. I picked up the phone and I called Reggie Jackson because I was curious about what he thought of the documentary. Reggie told me that he actually thought it was done very well and brought back a lot of memories and I have to agree with him. For me it was the best of Reggie documentaries that I have seen. November 1st of 1976, Reggie Jackson signed a five-year contract with the New York Yankees. Reggie along with Thurman Munson and the “Bronx Zoo” era Yankees would go on to four AL East titles, three American League pennants, and two World Series championships in Reggie’s five years in the Bronx. Even though Billy Martin wanted Joe Rudi, it was the urging of Munson that eventually had “The Boss” George Steinbrenner chase the flamboyant superstar all over the place until he got an agreement done on a napkin. I remember giving “The Boss” a Sports Illustrated cover that Reggie was on. It was titled, “Super Duper Star.” Mr. Steinbrenner’s eyes really lit up. For those five years, Reggie’s impact on New York was immeasurable. He truly was the Michael Jordan of that era. I used to say that Michael was the Reggie of his era. Anyway you put it, Reggie was dollar for dollar the best free agent signing the Yankees made even forty years later. Was he the straw that stirred the drink? Yes he was, but so was Thurman and the rest of the Bronx Bombers of that era. 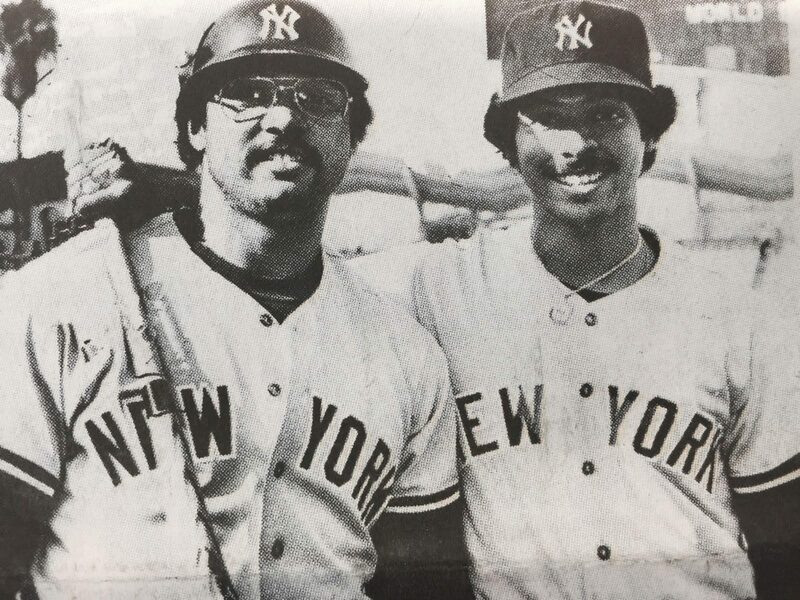 On a personal note, I will always consider Reggie Jackson a great friend and a big brother because like “The Boss,” Billy and Thurman, he always looked out for me and his honesty as a friend helped me grow up. The thing that I admired most about Reggie was weather it was a Muhammad Ali, John Lennon or Julius Irving, Mr October always appreciated the greatness of others. Oh and by the way, I can proudly say Thurman Munson and Reggie ended up being very good friends. It’s been 10 years since my first children’s book, the boy of steel. It was a book about a little boy who was suffering from cancer. At this time, I was heading a crusade with many baseball players, visiting kids with all sorts of ailments at hospitals. At the time there was a young boy named Christian Rivera who was about to start a battle of his own. Christian was about to be diagnosed with a very rare form of brain cancer called diffuse intrinsic pontine glioma or DIPG. Once diagnosed, just about 1% live about five years. Christian battled this disease for two years. In my book, the little boy wins his battle with brain cancer. In the real world, poor little Christian does not, but millions of others will because of Christian’s dad. John Gungie Rivera has started his own crusade to help find a cure for DIPG. John, a very successful music producer and promoter has dedicated his life to the Christian Rivera Foundation to help raise funds for hospitals and foundations researching cures for DIPG. When Christian was first diagnosed, the disease was so rare and there wasn’t much information about it so there was little hope for a cure. Through Rivera’s efforts and that of the great doctors there has been much progress. 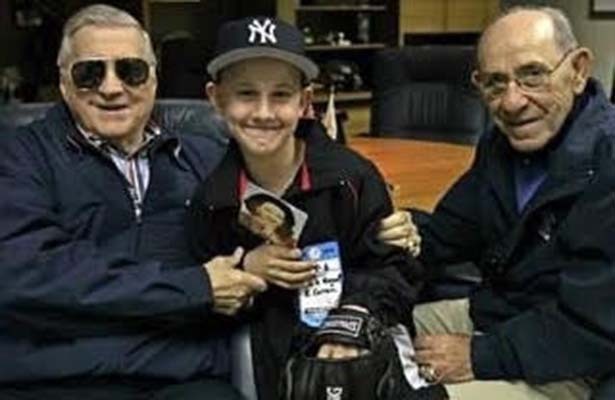 I have gotten to know John Rivera over the last few years now and can say that George Steinbrenner would have loved him because he just won’t give up and never will until they find a cure. I have four healthy kids and could never imagine loosing any of them. John’s fight is so that other innocent souls aren’t affected by this or any other disease. Like my great friend David Jurist, who’s daughter just lost a long battle to cancer, It takes great people in order to maintain this type of crusade. John Rivera is a great man who will not stop his efforts until the job is done. On Wednesday, the foundation will host it’s eighth annual Celebrity fundraising gala at the Broad Street Ballroom in Manhattan. Darlene Rodriguez from NBC news will host the event. One of the honorees is Dr. Mark Soudweidane, Director of the Weil Cornell Pediatric Brain and Spine Center. Besides being a great cause, it is also a great event attended by many well known celebrities. Come out and support a great event. For more information go to Christianriverafoundation.org. Ray Negron can be heard on ESPN Deportes 1050 AM every Sunday from 11am-1pm and also he writes for Newsmax. I have been writing for New York sports day for about six months. I was sitting outside gate four staring at the old Yankee stadium site, actually daydreaming about yesteryear and what I considered the greatest days in Yankee history. I get my incentive and motivation to write my books especially my children’s books by doing this a couple of times a day. One day as I was sitting there, Joe McDonald, the publisher of NY Sports Day happened to walk by and started a conversation with me. He talked to me about his website and asked if I would be interested in writing a column for him. I told him that I was already writing a column for Chris Ruddy and Newsmax and I told Joe that as long as I had the freedom to write about what I considered beautiful human interest subjects pertaining to sports and entertainment and not edited, then I was in. I told him that I would write about some of the biggest stars in the world but only about the beauty of the artist. I will let everyone else write about the rest. At that moment I called one of Chapman’s agents because I’m the type of person that has to confront possible negative situations head on. I told the agent that I had written the story to show everyone what a terrific individual Chapman is. I emphasized to him that Chapman did say to me that this was a business. The agent told me that he had not read the piece so I texted it to him. I am writing this column to apologize to Aroldis Chapman and his agents. When I wrote this piece it was meant to be a small sweet piece, not the giant that it turned out to be. The last thing that I would ever want to do is to hurt Aroldis in anyway. This guy is the hardest worker in sports and just a good guy. I guess I have seen the movie “The Pride of the Yankees” so many times that I almost envisioned myself in the role of Walter Brennan (the reporter that was always protecting Lou Gehrig) but in this case it backfired on me. The great Yankee owner George Steinbrenner used to say to me, “Sometimes you care too much about these guys (as I do) and someday you’ll find out that this truly is a business.” I guess I still haven’t found out. 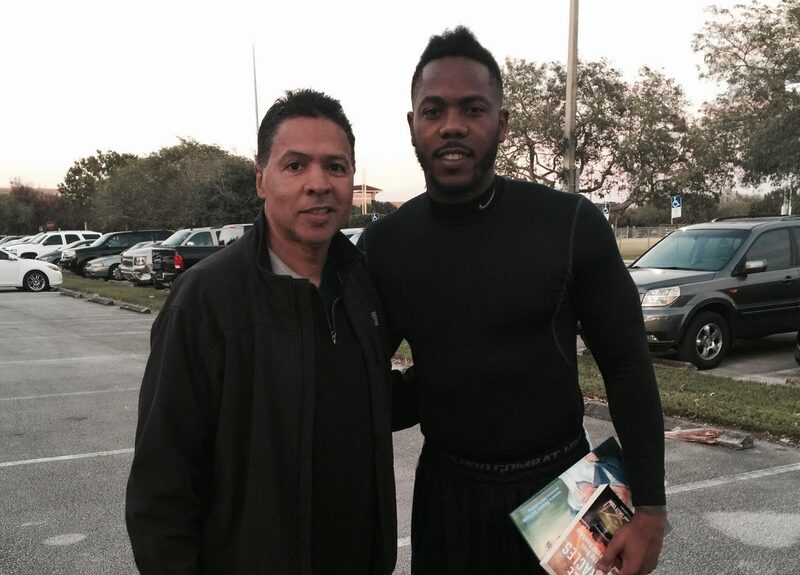 I will close by saying that I wish Aroldis Chapman and his family good luck in whatever city he ends up playing baseball in. Thank you for being a great highlight reel at Yankee Stadium and in all of baseball this year. Ray Negron can be heard every Sunday on his show “Impact” 0n 1050 am ESPN Deportes from 11 am to 1 pm and read on Newsmax. Negron: Aroldis Chapman- Will He or Won’t He? I got to spend some time with Aroldis Chapman on the phone this weekend. He just got back from the Latin Grammy’s this weekend in California and said, he had a blast. He says he is living the American Dream. He became an American citizen this year, and with winning the World Series and everything that has followed, he didn’t get a chance to vote, however he looks forward to voting next year. He says, that he is proud of being a world champion and was very happy to be able to contribute to the success of the Chicago Cubs. He said that 2016 turned out to be a the fantasy for him and getting traded to the Yankees was great because as most Cubans know, the Yankees have always been Cuba’s team. I said, then why can’t we just make it happen? He responded by saying, “This is business and the Yankees know that.” He does say that he knows that the Yankees were there when he was going through his difficult legal difficult problems last Winter. “They took a chance on me,” he said, “and I will always be grateful.” I got to spend a lot of time with this young man and I must say that he was always respectful and descent. Major League Baseball is entertainment. We are in the entertainment capital of the world. 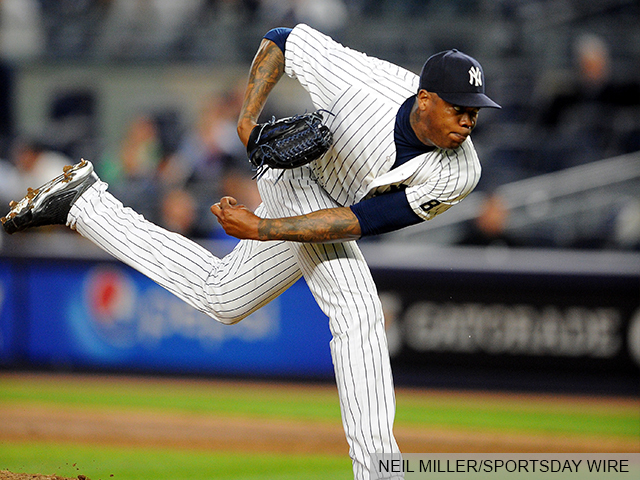 Like Elvis, Sinatra or in the Steinbrenner era of Reggie, New York deserves to have Chapman and his 105-mile fastball. I know that the Yankees would love to have him back for the fans and will do all they can, however as I told Chapman it takes two to tango. Negron: We’re Yankees. This is What We Do! This is the 10th anniversary of my first children’s book, The Boy of Steel. The book was about a boy who had cancer and loved baseball, and the Yankees. The inspiration came from my many visits to hospitals with players that were loved so much by so many of these kids. Believe it or not, the very first visit to hospitals and schools that I did on different occasions where with Reggie Jackson, Thurman Munson and Billy Martin. Billy was wonderful because he never liked planning anything. He just did it spur of the moment. He felt that he was blessed because his kids were healthy, especially his son Billy Joe. This was what George Steinbrenner loved about Billy. The Boss was the same way. He could be very busy in his office and if I had a kid with me that would want to meet him I would never hesitate to bring the kid into his office. Some of the people that worked for him would go crazy because I would do that but Steinbrenner always felt that the kids were more important and he would say.” I am the Boss.” I love that about him. I’m sure that is why his kids are the people they are today. I remember Billy Martin and the Boss coming back from a hospital visit with a New York big shot named Bill Fugazy, who set the visit up. They just couldn’t get enough of those kids. I asked Billy why and he said, “We’re Yankees, that’s what we do.” I never forgot Billy saying that and years later when I produced an animated film called Henry & Me with Joe Avallone and Reveal Productions, I had the line used by Richard Gere who played Lou Gehrig in the film. One of the most wonderful people that I have known in this game, from the standpoint of giving back, was Yankee outfielder Bobby Murcer. He was tireless and very giving. Like Munson and the rest mentioned, he had a very big heart. It is ironic that Bobby would die of cancer at the age of 62. I will never forget Mariano Rivera befriending another young cancer patient named Jack Szigety Jack’s chances of survival at the time were slim yet 12 years later Jack is a senior at Notre Dame. This past spring, the Make-A-Wish Foundation and our community relations director in Tampa, John Szponar, introduced me to a young man named Daniel Wilson. Daniel was a freshman in high school and through a mandatory checkup, discovered that he had thyroid cancer. Daniel went through a very extensive procedure, including a nine hour surgery at Children’s Hospital Philadelphia. He had a tube down his throat and he fought like a champion. To say that he was at spring training, I would call it a miracle. That is what these kids are. I will never forget when I walked him onto the field, one of the first players to come over to him was Dellin Betances. When Dellin put his hand on him, Daniel just broke down and cried. He was so happy to be meeting his hero, he just couldn’t believe it. Reggie came over and heard Daniel’s story and they became instant best friends. Willie Randolph, Goose Gossage, Mark Texiera, a true champion in making Daniel feel welcome. Not since Billy Martin has a Yankee manager been as giving and caring as Joe Girardi. Like Billy, you could just go up to Joe and let him know the situation and nine times out of ten, he will do his best for the individual. When I told him about Daniel not only did he come over and talk to him but he had Daniel walk the lineup card out to the umpires and let Daniel stay in the dugout to help him manage for two innings. That’s who Joe Girardi is. I’m proud to say that I know him. Daniel, like Jack, is healthy again and doing the fun things that boys his age are supposed to do like playing baseball etc. I wish that all of the stories with the kids I meet turn out this well but unfortunately they don’t. My very dear friend David Jurist and his family just lost their daughter Eileen. Eileen battled cancer for many years. To David, she was his princess and if you know her you would understand why. She was and will always be very beautiful. David has and will always help to battle pediatric cancer. David and his wife, Alice have done so much for Hackensack University Medical Center in the same way that Yankees team President Randy Levine and his wife Mindy are always there for Sloan Kettering. I will never forget a young Robinson Cano who was always going to the hospital to visit the kids. One day as I was driving him to the airport to go home after a long season, and we still had about three hours to kill, Cano said.” Let’s stop off at Sloan and visit some of the kids.” It was about 8:30 in the morning so I called the hospital to let them know. I think they thought it was a prank because they called Randy Levine who called me on the other line. Randy asked if I was trying to get to the hospital with Cano. I said.” Yes” and we laughed. He appreciated that Cano cared so much. That is why today Cano has the Robinson Cano Pediatric Physical Therapy Suite at Hackensack University Medical Center. Today we have Gary Sanchez and a whole new generation of Yankees that will continue a tradition that was actually started by Babe Ruth. Ray Negron is heard every Sunday on ESPN deportes 1050am at 11am and his column appears on Newsmax. “The Boss” The Real One, (George M. Steinbrenner) not Bruce Springsteen would have extended his hand to try and help America by helping to guide and in turn support out new President. I was a kid. from the streets of New York . I was used to seeing people get hit on the head with bottles, pipes, and on some occasions I even saw some people stabbed or shot. I was born in the Bronx and raised in Brooklyn. I was raised with Jewish, Blacks, Latin, and Italian kids. My parents finally moved us to Queens New York in an area known as Springfield Gardens. It was a whole different world. I did not have to worry about being stabbed or shot anymore. When I went to work for the New York Yankees as a batboy, I started to meet a lot of very interesting people. For whatever the reason, the owner, George Steinbrenner always introduced me to a lot of these people. He used to tell me, that is is important to get to know these guys. At the time, I never really knew why. I was just happy that “The Boss” thought enough of me, a dark Spanish kid with an Afro hair due to have me meet these distinguished individuals. “The Boss” always used to tell the story of how he caught me in the streets and gave me my first job. I remember meeting the former Secretary of State Henry Kissinger, former President Richard Nixon, real estate moguls (The Fisher Brothers) , Cary Grant, and countless stars from all fields. That real estate guy was Donald Trump. You could tell that Trump was a true fan of Mr. Steinbrenner. He would listen to every word that “The Boss” had to say very intensely and almost like a student with his professor. I remember throughout the years being in the office of “The Boss.” His secretary Joanne would say, “Trump on Line 2.” The Donald would call for advice all the time. It’s funny that I saw a lot of the same mannerisms in Trump that “The Boss” had. As time progressed, I saw the strong ego develop in Mr. Trump when I would see him come to Yankee games in the Bronx. But he was always a gentleman! After “The Boss” died, I would periodically run into “The Donald” at many charity events run by Lenny Caro who at the time was the President of The Bronx Chamber of Commerce and then Chief Community Relations Officer at Mercy College. Many of these events supported all types of minority issues including my own youth baseball program which I ran with Hank Steinbrenner that helped many Black and Latino kids stay in school and play baseball. and I really appreciated the sincerity. The other day some reporters who knew about the fact that “The Boss” had a relationship with Trump said that Steinbrenner would have voted for Hillary Clinton. Well I would say, these people did not know George Steinbrenner. So saying that was just a far fetched guess on their part. George Steinbrenner, as many know, was a great patriot and he would always do what was best for America. Whether it was Clinton or Trump, his respect was for whoever was sitting in the Oval Office. 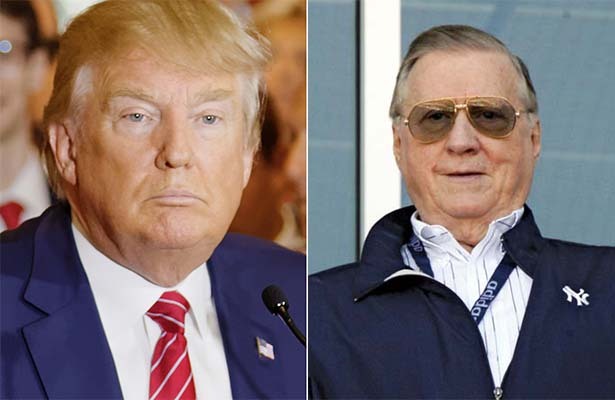 I am very sorry that George Steinbrenner isn’t alive because he would have been a very positive influence in Trump’s preparation for the White House. And, I guarantee you that many of the negative issues that came out, in my opinion they never would have. However we will never know for sure. When I heard that there would be a protest down 5th Avenue , I decided to act like a true journalist and walk about 20 blocks to feel what the protest was all all about. What were the people that were marching really thinking? Were their hearts in the right place? I found that that there were a lot of people that really care about this country and really want what’s best, and I was proud of them for that. However, I also found a lot of people that just wanted to start trouble. Thank God that the New York City Finest, the police really did an outstanding job of keeping order. At the end of the day, whether we like it or not, Donald John Trump is our 45th President. I know, “The Boss” would have said we have to give him enough rope to hang himself. And if he doesn’t, then America truly will be great again. October 27th is a day I will never forget. I would go to the Krauss Funeral Home to see my mom. I knew that when I saw her laying there it would really put a finality to the situation. My wonderful mom was really gone. My whole life, the one person that would never die was my mother, Jenny. She was my Superman, or in this case, Superwoman. She was not afraid of anything or anyone. IN my mind, she would always be there. I was supposed to be at the funeral parlor at 2 p.m. I arrived at 1:45. Two of my closest friends, Charlie Santoro from the YES Network and Richard Gere were already there with my other very close friend Russell Hernandez. Richard Gere would say “Why are you late?” and we laughed. All my friends made it easier for me. They understand my great bond with my mom. I never hugged so many people in my life. Some of them two or three times. My buddy Alfred Zaccagnino sent flowers so tall that it almost touched the ceiling. My mom loved flowers and Alfred knew that. I told him that he should not have spent so much money on them. He said that I should mind my business because she deserved the best. I loved all the flowers, however I couldn’t help notice how beautiful the flowers from Randy Levine, the New York Yankees team president were. When I thanked him, he responded by saying that it was an honor. Some of my cousins ran over and asked, how did Aunt Jenny know Frankie Valli? I responded by saying I think it was more like he knew her. Frankie and his band sent incredible flowers. Knowing my mom she would have said let’s take them home. Frankie was in town performing on Broadway with the Four Seasons, so I knew there was no way he was going to be at her wake. The next day was the burial. As we were pulling out from the funeral parlor ironically the radio was playing the Jose Feliciano hit, “Light My Fire”. It made me feel so proud that Jose had wrote a song for my mom when she was in the hospital entitled “ Si Yo Me Salgo de Aqui (If I get out of here)”. It’s a song about what she would do if she ever got out of the hospital. My mom loved music very much. A lot of people didn’t know that about her. Her favorite past time was sewing. My childhood friends Hector and Ivan reminded me how she was always whistling and humming as she sewed. After the burial everything has been a blur. My buddy Richie Canata, an original member of the Billy Joel Band honored my mom by playing a “New York State of Mind” for her. He told the audience that Jenny was looking down on us. Every time I hear that song I will think of her. Thank you Ritchie! Saturday I was in a complete fog. I was just driving around to anywhere and nowhere. I was just listening to music when my phone rang. It was Craig Pilo, Frankie Valli’s drummer and just a real good guy. He told me to get to the Lunt-Fontanne theatre and meet Frankie and Robbie Robinson backstage before the show. I picked up my great friend Aris and we rushed to Broadway. When we got there we met with Frankie in his dressing room. Then we went back stage. Frankie and the band said a wonderful prayer led by Robbie Robinson which honored my mother Jenny. At that point as the group was going on the stage they took a picture of my beautiful Jenny on the stage with them. Can you imagine my mom on stage with Frankie Valli and the Four Seasons. I sat backstage. I said to myself what an incredible once in a life time seat. Frankie and the band were better than ever. 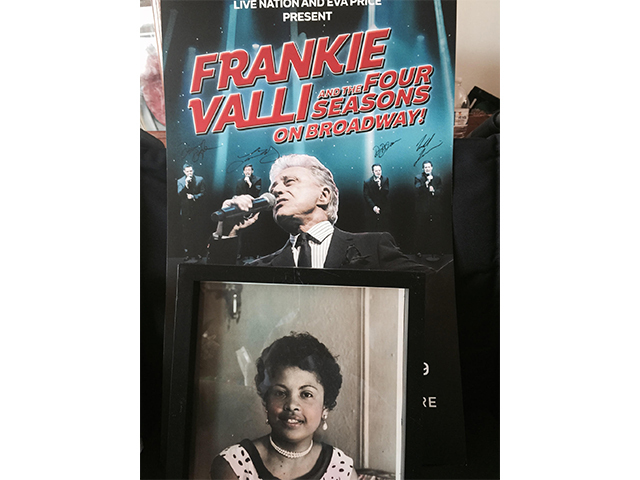 My mind was playing tricks on me because even though my mom was not a dancer I could almost see her dancing to every song that Frankie sang. When Frankie got to the song, “Can’t Take My Eyes Off of You” I knew that it was for her. I listened to the words carefully, “you’re just too good to be true, can’t take my eyes off of you, you’d be like heaven to touch, I want to hold you so much. At that moment, I was overwhelmed with tears of joy for my mom and sadness for me. I never thought that I would miss my mom, my greatest teacher, so much, but I do. It was such a beautiful moment on stage that it was almost like the ending of a great movie and I decided that it was time to let go, walk out of the theatre and to my next stage in life. I want to thank everyone from the bottom of the hearts of my sisters, Naomi and Nancy, our pop Ciro, and all the grandkids for the tributes that were paid for a very nice person: the original Jenny from the block.